With Decker's Horse Washer you can give your horse the luxury of hot water in your barn, corral, at horse shows, rodeos, fairs or anywhere there is a water source. 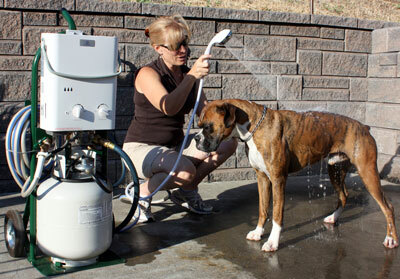 Decker's Horse Washer is also great for lamas, goats, dogs or any animal that would benefit from a hot wash. Simply connect a garden hose to the Horse Washer. When the water nozzle is opened the burner automatically lights and in seconds provides an endless supply of hot water. Set the temperature and your ready. When the water flow is shut off the burner automatically goes out. 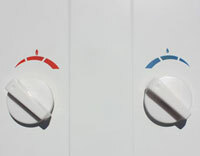 With tankless there is no waiting for the water to heat up and you never run out. Decker's Horse washer�connects to any water faucet or can be used with optional 12v pump�to deliver water from a lake, stream, storage tank or even a bucket when there isn't a pressurized water source available.� The horse washer can also be connected to a water tank in your trailer. 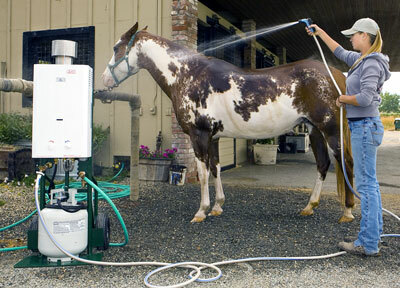 Imagine returning to your trailer after a long trail ride and giving you and your horse a relaxing hot shower. 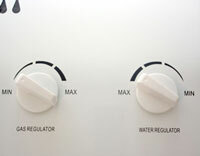 Adjustable water temperature from 80-120 degrees F. Start with the Water Regulator at Max and the Gas Regulator at the minimum setting. 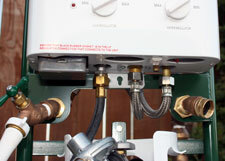 If the temperature is too low increase the Gas Regulator until the output water is the desired temperature. If the intake water is extremely cold you may have to turn down the Water Regulator until the desired temperature is reached. Once it is set the temperature will remain the same as long as the source water temp stays constant. Decker's Pet washer is completely portable and easy to transport.� It� connects to any water faucet or can be used with optional 12v pump�to deliver water from a lake, stream, storage tank or even a bucket when there isn't a pressurized water source available. Tired of your dog running away when he sees the shampoo?� Now you can take the stress out� of shower time for your pet with Decker's Pet Washer.� The pet washer delivers a luxurious flow of up to 1 1/2 gallons per minute of heated water. � Like it's big brother the Horse Washer, it's tankless so you don't have to wait for the water to heat up and it won't run out.� Includes multi function nozzle with on/off control.